Not every Northwestern student spent Spring Break on a beach, spending money on gas, drinks and nice dinners. Some stayed on campus, where residence halls stayed open. But although the dorms remained open, the dining halls did not. “Eating even just one or two meals out during the week is pretty expensive,” said Weinberg sophomore Matthew Griswold, an incoming co-president of Points for a Purpose, a student group that raises money to fight food insecurity. So this past Spring Break, the group provided bags of food to students who stayed on campus and were without access to dining halls. Communication sophomore Matt Faden, one of the group’s outgoing presidents, estimated the project cost roughly $1,000 in student-donated points. The group filled about 40 bags, each designed to have enough food to last the break. 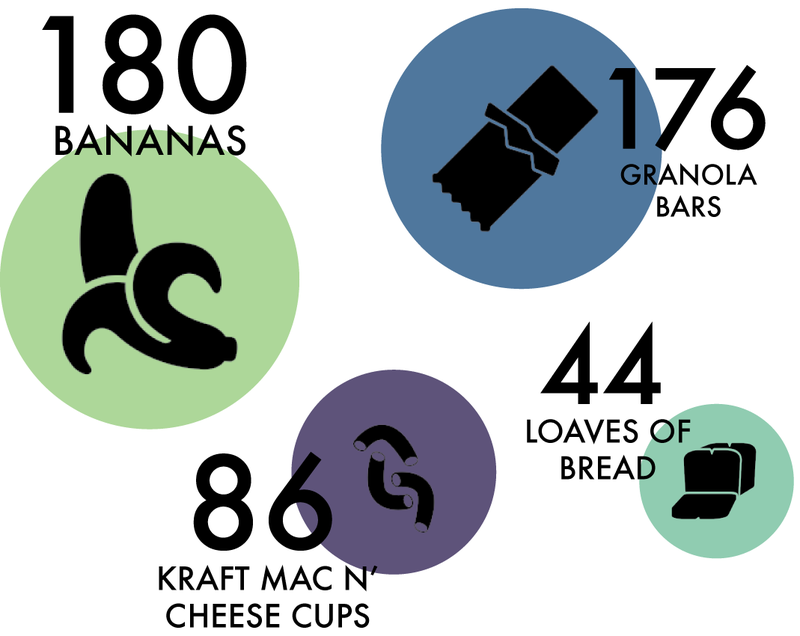 Provisions included bananas, a loaf of bread, peanut butter, jelly, Cheerios and microwavable meals. “There was lots of Easy Mac,” Griswold said. Points for a Purpose receives their money through pooling leftover meal points, which students can donate at C-stores and other Sodexo-run food vendors during the final weeks of a quarter. In the past, proceeds helped feed food-insecure individuals in the Evanston area. This project was new ground, Faden said. It was the first time the group used student-donated points to help fellow students. Students’ meal plans do not provide swipes usable during Spring Break, said Rachel Tilghman, Sodexo’s spokesperson at NU. Tilghman said the University used to offer a Spring Break meal plan, but demand for it was dismal. The low demand, paired with concerns about food waste, led Northwestern Dining to discontinue the plans, Tilghman said. This year, the vendors that stayed open were ones that accepted Cat Cash or points, such as the Norris University Center food court and C-stores. Sodexo, the private corporation that operates NU’s dining halls and stores, tracks the amount of student-donated points and works with Points for a Purpose to order food. Both Faden and Griswold said the group’s relationship with Sodexo is largely positive. The bags of food were distributed from the Scott Hall office of Student Enrichment Services, an office that supports low-income and first-generation students. Kourtney Cockrell, director of SES and its sole full-time employee, said she sent out a survey to students gauging interest in such a program, which Points for a Purpose used in planning the project. Cockrell said her office also added Cat Cash to students’ WildCARDs and hosted meals for students still on campus. The Points for a Purpose program was especially appreciated, she said. SESP senior Qunsia Daniel, who participated in the program, said it was “absolutely amazing” to have the food for break. She also recalled when, her freshman year, some friends invited her to go out with them, saying it would cost about $25. Faden said food insecurity on campus is often “overlooked” by students and that students are not always comfortable talking about financial differences. Griswold agreed and said he hopes the project makes students more aware of the issue.